Analysis: Donald continued his streak of dominant play through Week 8. 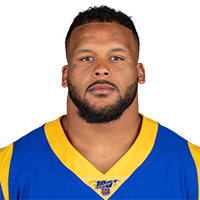 After being held without a sack in the Rams' first three games, Donald has averaged two per week the last five. He leads the league with 10 sacks, which is one short of his career high mark of 11. He'll look to maintain his momentum in Week 9, when the Rams face off against the Saints. Analysis: This was easily Donald's most dominant game of the season. He doubled his sack total to eight, and the nine tackles improved the All-Pro defensive lineman to 26 (17 solo) for the campaign. Additionally, the bulk of that production has come through the past four games. Continue to roll out Donald confidently in IDP settings. 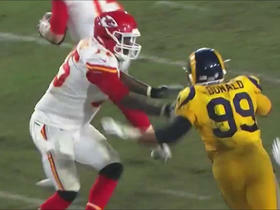 Analysis: Donald's four-sack effort catapulted him to the league lead in sacks on the season. After starting the year off slow, he's racked up eight sacks in the last four weeks and showed why he deserved the giant contract extension he signed prior to the regular season. He'll look to get after Aaron Rodgers in Week 8 as the Rams aim to take down the Packers and stay undefeated. Donald logged three tackles (two solo) and one sack in Sunday's win over the Broncos. 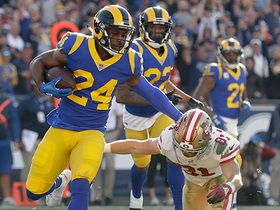 Analysis: Per usual, Donald's impact on the game went well beyond the scoresheet, as he and the rest of the Rams front seven was able to limit the Broncos to 60 yards rushing on 17 carries. Donald will look to continue his dominance against the 49ers in Week 7. Donald totaled two tackles and a sack during Sunday's 33-31 win over the Seahawks. Analysis: Though the defensive tackle didn't rack up the stops, Donald made his presence known in the first quarter when he took down Russell Wilson. 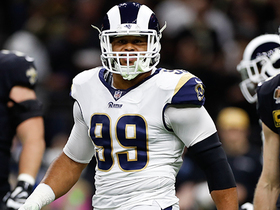 Donald now has three sacks on the year after beginning the season with zero over the Rams' first three games. He'll look to keep his streak going Sunday against the Broncos. Donald recorded two sacks, five tackles (three solo) and hit the quarterback four times during Thursday's 38-31 win over Minnesota. Analysis: Both of Donald's sacks came in the fourth quarter and helped end Minnesota drives. They were also key factors in finishing the Vikings' comeback bid. Following a sluggish three-game start to the season, this was easily Donald's best showing of 2018. Expect Thursday's strong outing to kick-start a solid run from the All-Pro defensive lineman. Donald has recorded just two solo tackles -- five total -- without a sack through the first two games of the 2018 season. Analysis: Sometimes real-world dominance doesn't translate to fantasy greatness, so while Donald's slow start to the campaign is discouraging, it's difficult to envision him posting such pedestrian numbers over the long haul. 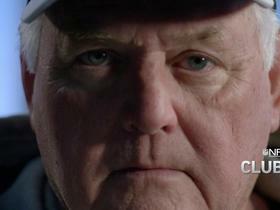 Patience is all but guaranteed to be a virtue with the three-time All Pro defensive lineman. 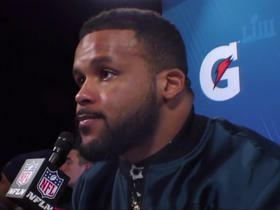 Donald was promoted to the Rams' active roster Saturday. Analysis: The move was expected given that Donald needed to be promoted to the active roster by Saturday afternoon to be eligible for Monday's season opener against the Raiders. It remains to be seen whether Donald will be able to handle his full workload after a lengthy training camp holdout, but the 27-year-old star lineman will certainly suit up in some capacity Sunday. Donald and the Rams are finalizing a six-year, $135 million contract, Adam Schefter of ESPN reports. Analysis: Donald's new contract easily sets an NFL record for non-quarterbacks, averaging $22.5 million per season. The timing allows him to prepare for Week 1 against Oakland, with his lengthy holdout coming to an end nine days before the Rams' season opener. The 27-year-old has averaged 51 tackles, 9.8 sacks and 2.3 forced fumbles per season through his first four years in the league. Rams head coach Sean McVay suggested Tuesday that Donald is close to signing an extension with the team, Lindsey Thiry of ESPN.com reports. "Things are heating up," McVay said of negations between the front office and star defensive tackle. "You might see [an extension agreement] sooner than later, you know? It could happen. It's exciting. We're very optimistic. Seriously, we are." Analysis: There must have been some sort of progress Monday or Tuesday after McVay said there was no update on Donald's situation when the coach was asked about the matter over the weekend. Donald seemingly has no intention of reporting to the team without a new contract in hand, but it sounds like that may happen soon enough to allow for an active status Week 1 against the Raiders. Coach Sean McVay said there is no update on Donald's contract situation, Lindsey Thiry of ESPN.com reports. Donald is on track to sign an extension before Saturday's preseason game against Oakland, Jason La Canfora of CBS Sports reports. Analysis: Rams GM Les Snead said last week that the team was close to reaching an agreement with Donald, after locking down Brandin Cooks and Todd Gurley during the offseason. While it may already be too late for the star lineman to make an in-game appearance during the preseason, Donald should be able to handle his full workload in Week 1 if he reports to the team within the next 2-3 weeks. He seemingly has no intention to report without a new contract in hand. Rams general manager Les Snead said the team is making progress toward a contract agreement with Donald, Rich Hammond of the Los Angeles Daily News reports. "In the same zip code, area code, ballpark," Snead said of negotiations with the star defensive lineman. "Zip code usually means you're close but still haven't agreed." Analysis: With his holdout now dragging through the second week of training camp, Donald missed Tuesday's deadline to accrue a season toward unrestricted free agency, though it won't make any difference if he ultimately gets his long-term contract. The Rams hope to avoid a repeat of 2017, when Donald reported to the team one day before the regular-season opener and wasn't cleared to play until Week 2. 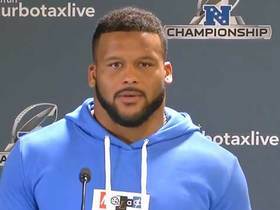 Sean McVay said "I'd be surprised" when asked if Aaron Donald would report to practice Tuesday, Jason La Canfora of CBS Sports reports. Donald was officially placed on the Reserve/Did Not Report list Friday, Lindsey Thiry of ESPN.com reports. Analysis: Donald's absence from camp comes as no surprise, as it was previously reported that he wouldn't report while he angles for a contract extension. It's unclear how long Donald will hold out, but it isn't expected to impact his status for the regular season at this point. Look for Ethan Westbrooks or Tanzel Smart to get some extra reps with the first-team defense while Donald is absent. Donald wasn't present for the start of the Rams' training camp Wednesday, Ian Rapoport of NFL Network reports. Donald won't attend Los Angeles' upcoming mandatory minicamp, Field Yates of ESPN reports. Analysis: Donald heads into the final year of his rookie deal and is looking for a hefty raise and long-term extension. With the two sides having yet to come to an agreement, he'll be a minicamp holdout, and there's a chance that extends into training camp for a second straight season depending on how quickly things progress. Donald is already a four-time Pro Bowler and is coming off a 2017 campaign where he nabbed NFL Defensive Player of the Year honors, so he has plenty of bargaining chips. Donald was absent from OTAs, which began Monday, Adam Schefter of ESPN reports. Analysis: Donald is still seeking a long-term deal as he enters the final year of his rookie contract. Rich Hammond of the Orange County Register notes that Donald skipped OTAs last season, reported for mandatory minicamp, and then began his holdout at the start of training camp. Whether the Rams and Donald will have a similar standoff remains to be seen, but either way, he's unlikely to participate in voluntary OTAs this week. 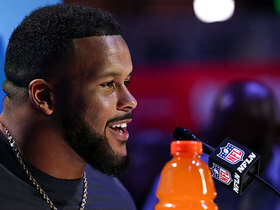 The Rams' addition of Ndamukong Suh shouldn't have much impact on how Donald (undisclosed) lines up in the defense, ESPN.com's Alden Gonzalez reports. Donald (undisclosed) re-signing a long-term contract is a major priority for the Rams, but general manager Les Snead said there currently isn't a timeline for when the deal will be inked, Kevin Patra of NFL.com reports. Donald will miss this year's Pro Bowl due to an undisclosed injury, Rob Demovsky of ESPN.com reports. Donald won't play in Sunday's game against the 49ers, Lindsey Thiry of the Los Angeles Times reports. Analysis: An obvious candidate to be rest, Donald owns a per-game average of 56 snaps, a massive number for a defensive lineman. He's made the most of the workload with 41 tackles (32 solo), 11 sacks and five forced fumbles in 14 games. Donald is a legitimate candidate for Defensive Player of the Year honors, as there's no runaway favorite for the award this year. Donald accumulated five tackles, three sacks and one forced fumble Sunday against the Seahawks. Analysis: Lets get this straight, Seahawks QB Russell Wilson is no easy man to bring down, making Donald's feat even more impressive. To sweeten it up even further, he got this done while playing just 39 of 57 possible defensive snaps. 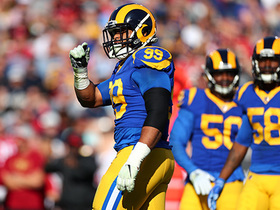 Donald now has five sacks in his last three games, and he leads the Rams with 11 total. At this rate, he's a matchup-proof IDP threat. Donald compiled three solo tackles and two sacks Sunday against the Cardinals. Analysis: Although he's averaging just 2.9 tackles per game, Donald had eight sacks through 11 contests. With a matchup against the Eagles on the Week 14 agenda, Donald will have a tough test in front of him. Eagles RT Lane Johnson was able to keep Seahawks DE Michael Bennett from QB Carson Wentz for their entire Week 13 matchup, so Donald will benefit from being on the opposite side of the line. 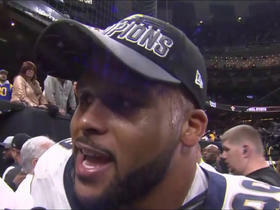 Donald recorded five tackles (three solo) and a sack during Sunday's 26-20 win over the Saints. Analysis: Donald has now registered 27 tackles (20 solo), six sacks and three forced fumbles through the past nine games, as the star lineman continues to provide high-end fantasy numbers. Considering his track record, there's no reason to expect Donald to slow down over the coming weeks, either. Donald registered three tackles (two solo), a sack, a pass defensed and forced a fumble during Sunday's 33-7 win over Houston. Analysis: Make it four consecutive games with a sack for Donald, as it appears he's just hitting full stride when it matters most in the real and fantasy game. The Rams high-scoring attack has been forcing opposing offenses into predictable game scripts, and Donald and the rest of the defense are thriving. It's currently a cushy setup for Donald, and barring an injury, there's no reason to expect his performance to dip moving forward. Donald registered three tackles and a sack during Sunday's 51-17 win over the Giants. He also forced and recovered a fumble on New York's first drive. 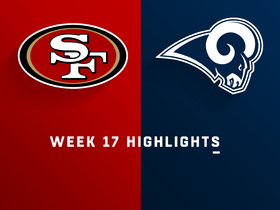 Analysis: Donald's strip and recovery on the opening Giants drive set the tone for the game, as the Rams scored four plays later and victory was never in serious jeopardy from there on. The star lineman has recorded a sack in three consecutive games and also has seven solo tackles during that span. Not only is Donald a strong weekly option in all IDP settings, he might just be rounding into top form for the fantasy stretch drive.